The fastest way to turn off the Amazon Fire Stick. Follow this quick guide to learn how to turn off the Amazon Fire Stick or Fire TV. The fastest and easiest way to turn off the Amazon Fire Stick is with the remote. There are two easy steps that take about 5 seconds to put your device into sleep mode. Step 1: Press and hold the “Home” button on the remote for 3 seconds. Holding down the home button will pull up the quick access menu on your TV screen. Select “Sleep” in the menu and your screen will turn black. That's it! You device is now in sleep mode. Ready to watch TV again? Press any button on the remote to wake the Fire TV Stick from sleep mode. 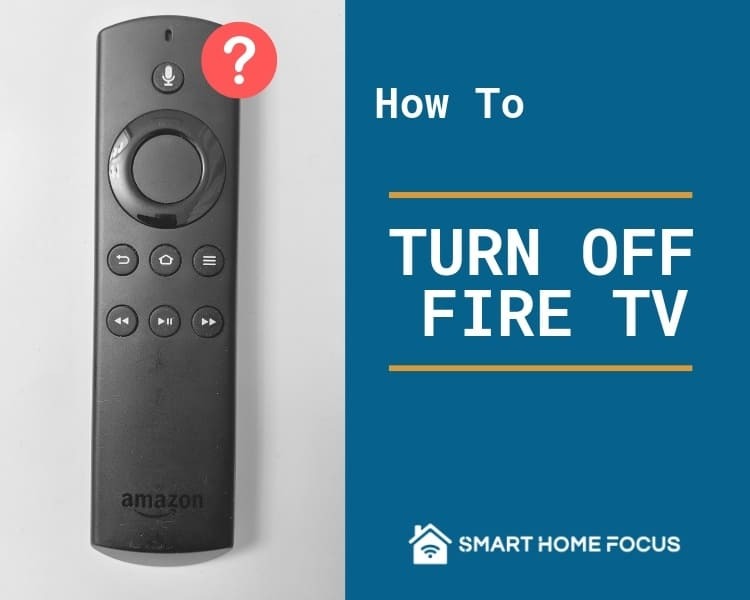 If your remote is across the room, then you can turn off the Amazon Fire Stick with your phone. Just download and install the Amazon Fire TV app onto your phone. Open the Amazon Fire TV app and connect to the Fire TV you want to control. Step 2: Select “Remote” in the bottom menu list. Select the remote function in the menu list at the bottom of the app. Step 3: Select the “Gear” icon in the upper left corner. 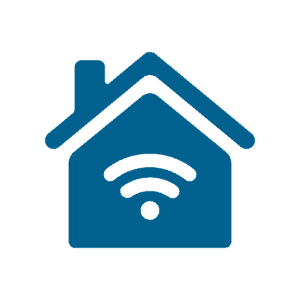 The "gear" icon will give you access to the sleep function and settings to the Fire TV application. Select "Sleep" in the menu and your screen will turn black. Done! Your device is now in sleep mode. Press any item on the remote app screen to wake the Fire TV Stick from sleep mode. 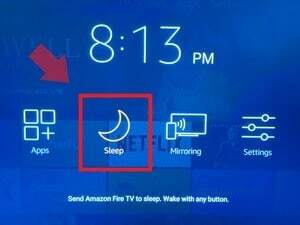 What is Fire TV Stick Sleep Mode? You probably noticed in the guides above that you are not really turning off the Fire TV Stick. You are actually putting the Fire TV Stick to sleep. When the Fire TV Stick is in sleep mode, the TV screen will be black, but the device can still receive automatic software update. If you want to fully turn off the Fire Stick, then you can unplug the device. Your Fire TV Stick will automatically put itself into sleep mode if there hasn’t been any activity for 20 minutes (30 minutes for Gen 1 devices). You can wake your Fire TV Stick from sleep mode by pressing any button on the remote or in the remote app. Upgrade to the new remote! Control all of your TV and entertainment center devices with the new Fire TV Stick and Voice Remote.